Domestic manufacturers seem to have really upped the ante. Today under scrutiny is the XOLO A500S, the newest member in the XOLO family. The phone, as you guessed, is another budget device selling for under 10k INR and comes with average specs which include a dual core processor. However, something bound to make you look again is the phone’s body, which we think looks great and fresh. The phone can be classified as an entry-level device, now that dual-core has become the standard. The phone will be retailing for 6,999 INR in the coming few days. Let us go ahead with the quick review and talk about the basic specs of this device. This sleek phone packs a 5MP main shooter which you find sitting at the rear of the device. At the price point of 7000 INR, we do think this is a pretty good bargain, at least in terms of camera. The time is long gone when a 5MP camera device cost upwards of 20k INR! However, you can expect the 5MP unit to be as good as a 3.15MP unit from an international manufacturer like Sony or Samsung. The front on the A500S features a VGA unit, which again, is about the standard in the range we’re dealing in. You can expect the unit to function quite OK with no exceptional performance. The storage on the device, yes you guessed right (no points though), is a paltry 4GB. This means that the final user-available memory would be about 2GB, and the need to expand storage would be inevitable. The phone does have a microSD slot which will allow you to expand storage by up to 32GB, and we would expect this slot to be occupied in most phones since 2GB is definitely not enough on a smartphone today. The phone packs a 1.2 GHz dual core processor which does sound interesting. Domestic manufacturers have indeed taken it up a level by going for dual core processors instead of single core ones, and this has been possible only due to the low-cost revolution brought about by MediaTek. About a year back, you couldn’t dream of a dual core device for anything lesser than 15k INR. The dual core processor will suffice for most daily tasks such as email and casual gaming, however do not expect miracles. The phone features a rather teeny battery of 1400mAh. At this time, when the averages are tending to 2000mAh and above, we did expect something better, but well, you get what you get. You can expect the phone to take you through one work day. XOLO advises that the phone will last 10hrs on 2G talktime and 8hrs on 3G. The phone comes with a 4 inch TFT screen, which packs a WVGA resolution of 800×480 pixels. This is a feature we’ve seen on many smartphones in the country that sell for under 10k INR, and the XOLO A500S is no exception. You can expect a certain degree of pixelization on the screen of the device since the pixel density isn’t as high as other phones in the market. We calculated the density to be 233 PPI. Among other features, the phone packs Android 4.2 as the OS which is impressive since even prominent manufacturers have not yet updated all their devices to v4.2. With v4.2, users can expect better battery management from the part of the OS. Apart from that, the phone comes with a few tools and services pre installed, among which one lets you track the phone’s location, thus acting as an anti-theft tool. The A500S is just another addition to an already overpopulated list of budget dual core devices in India. These devices come from various manufacturers like Micromax, LAVA, Karbonn, etc. Micromax Canvas Lite A92, Karbonn Smart A12 and Smart NaMo Saffron A209 are just a few phones from the aforementioned list, since mentioning all is beyond the scope of this post! We have seen quite a few dual core phones in the past. However, the XOLO A500S boasts of a fresh and sleek design which we hadn’t yet seen in the segment. Apart from that, XOLO phones are known to have a better build quality than most other domestic and Chinese brands. 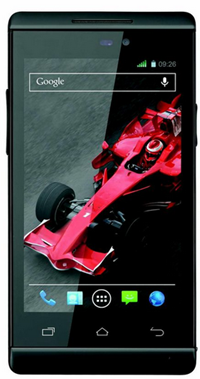 If this is what you’re looking for, the XOLO A500S will definitely make a good phone for you. Otherwise, there are options plenty in the market, with more to come! Really nice phone, my waiting for my dream and under budget phone is over after looking this phone of XOLO. We are coming up with full review very soon. Does it have a Cortex processor or a MediaTek? its mediatek processor and Cortex is an architecture. can i go for buy this phone or not??? yes you can buy this phone. Its a good value for money, but consider xolo a600 as well thats also good phone at affordable price.